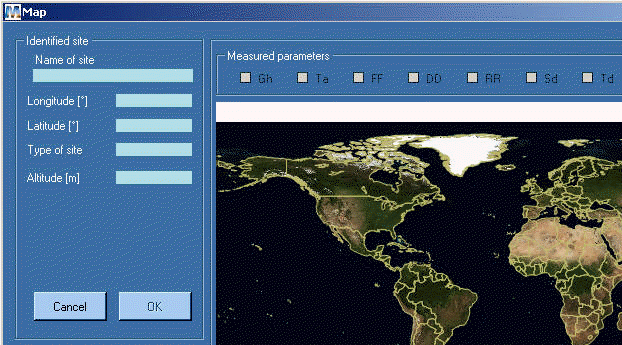 The global meteorological climate database combined with a weather generator for engineers, architects, teachers, planners and anyone interested in solar energy and climatology. Also for schools and universities, for teachers, tutors, scholars and students. A comprehensive meteorological reference, incorporating a catalogue of meteorological data and calculation procedures for solar applications and system design at any desired location in the world. You can buy METEONORM directly online. Order the software license online via secure and rapid electronic procedure. Masz pytania dotyczące zakupu online? The pages of Customer-Care-Centre shall give you answers to the online process. Maps of yearly means of global radiation can be produced for any region of the world between 60°S and 60°N. Effects of high horizon considered in radiation calculations. Terrain elevation data is based on 90x90 m resolution digital terrain data of NASA’s Space Shuttle Radar Topography Mission (SRTM). Terrain elevation data is stored in tiles with a size of 3x3° which overlap each other by 1°. Monthly mean values of global radiation for various regions of the world are based on ground data and satellite imagery. Interpolation models to calculate mean values for any site in the world. Import of current data by internet (import of current monthly values). A single user license can be installed and registered once. A second installation is allowed, e.g. one installation on a desktop computer and one on a notebook. Multi user licenses are recommended for a department/company environment where several workstations require a license. The multi user license is limited to one department/company with the same address. For restricted educational use, METEONORM offers tutorial licenses which are limited for one year. These are combined in a package with a single user license. In addition you have to pay VAT.Remark: Any transfer and other fees must be covered by you. A free form order containing precise data of the licensee and billing information and your e-Mail address shall be sent via E-Mail to meteonorm AT kornicki.com or via Fax at +43.1.6157099. We will send you the bill confirming the order. After your money transfer has arrived to our account in full we will send you the activation information via E-Mail. With respect to multiple or academic (tutorial) licenses or update purchase please send us your request via E-Mail to meteonorm AT kornicki.com. The install package of the software can be downloaded here. Downloads run in demo mode for 10 days. To change to full mode, you need to buy and register the software. The Manual (Documentation) of the program (Part I, English, pdf). The Theory of the program METEONORM (Part II, English, pdf). The product description (METEONORM Info Flyer, English, pdf). Who will answer my operational or technical questions? Is there any support or service contract offered? No. E-Mail or telephone support is included with the purchase fee. Is second installation onto a mobile computer allowed for the same user (at no addition costs)? Yes. Second installation for non-concurrent use is granted by the manufacturer. A second installation code must be registered. Is installation onto terminal server supported? No. Even if some users have managed to succeed with that, there is no support provided by the manufacturer!